In the previous article I have explained, how you can set up your domains, which are rented from Namecheap.com, for use with DynDNS (Dynamic DNS). In this article, we will focus on how to configure your Fritzbox, so that it always sends the current IP to the Namecheap DynDNS interface. While this also possible through various clients for PC or MAC, I find the configuration with Fritzbox particularly attractive, because it is anyway running around the clock and thus no PC or MAC unnecessarily consumes more power. Log into the webpanel of your Fritzbox. This should be normally accessible by navigating to http://fritz.box or http://192.168.178.1 in a browser of your choice. Also, if I rent my webspace (and now my VPS) always from german companies, my domains are with a foreign supplier. Specifically at Namecheap.com. This has several reasons. I’ve only had good experience there, I really like their web interface, the payment by Paypal and also the support is really fast. One of the features which suits me very well at Namecheap.com is the possibility to use DynDNS with all domains registered there. And moreover it’s free. With other providers, you pay for it often. How to configure a domain on Namecheap backend, so that the DNS records can be updated automatically, I want to show you in the following. In the first step you log into your account at Namecheap.com. 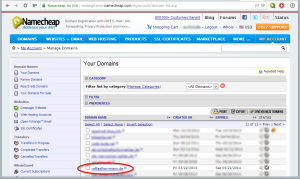 Then select the domain for which you want to enable the DynDNS service.